Single room supplement: Rooms will be shared. Single rooms will require an additional cost of $500. Tour cost does not include: Airfare to Shanghai Pudong International Airport and from Hangzhou Xiaoshan International Airport, visas, immunizations, traveler’s medical insurance, and tips are not included. We’re happy to advise you in booking your flights to China and procuring your visa. Physical demands: Travel in rural areas is physically demanding. Guests should be prepared for hiking and occasional rough terrain. If you are unable to hike due to joint, blood pressure, or balance issues, or a fear of insects, please be aware that this may limit your experience on the tour. To reserve your space on this tour, please contact us. To be on time for the beginning of this tour, you must arrive in Shanghai’s Pudong International Airport (airport code PVG) no later than April 6th, 2019 at 12:00 Noon. From there you will take a few hours drive to Huzhou City where we will have a restorative afternoon tea session where you can recover from your long flight while sampling freshly made teas from this Spring. In the evening we will share the first dinner of the tour, tasting the distinctive regional cuisine of eastern China. Today we will drive into the Tai Lake region to visit the origin of the Bi Luo Chun green tea. Authentic Bi Luo Chun comes from two places in Suzhou, Dong Shan and Xi Shan (now called Jin Ting Zhen). We will visit Jin Ting Zhen, which is an island in the large freshwater Tai Lake, and is known for having the best Bi Luo Chun. We will bring you to the tea maker we buy from personally in the authentic origin of this tea, Master Lu. Master Lu will take you to visit his garden and demonstrate each traditional step from plucking and hand-processing processing for making the best quality of Bi Luo Chun. Bi Luo Chun, is often faked on the open market in China, but Master Lu will teach you how to identify the flavor and characteristics of the real thing. Naturally this involves drinking plenty of freshly made Bi Luo Chun! We will have lunch with Master Lu on Tai Lake made fresh from the region’s gardens. After lunch we’ll drive to Yi Xing, a city bordering Tai Lake and famous for its pottery. Yixing tea pots are also known as Zi Sha Hu, or purple sand tea pots. The unique unglazed clay with its high concentration of iron has been considered the ideal material for brewing tea for centuries. You’ll meet master potters and artists who will show you how to appreciate and use this type of teapot, and they will make a pot in front of you. If you love Yixing pottery (we do!) this is the place for you. Yixing was famous during the Tang Dynasty for its Tribute Tea, called “Yang Mu Cha.” We’ll try the local black tea while we’re here. Day 3 is all about An Ji, an area famous for its green teas, such as An Ji Bai Cha. An Ji Bai Cha is one of the Song Dynasty Emperor’s favorite teas, but was lost for centuries until the early 1980′s. This tea is famous for being extremely rich in amino acids, which lend the tea its signature sweetness and smooth flavors. 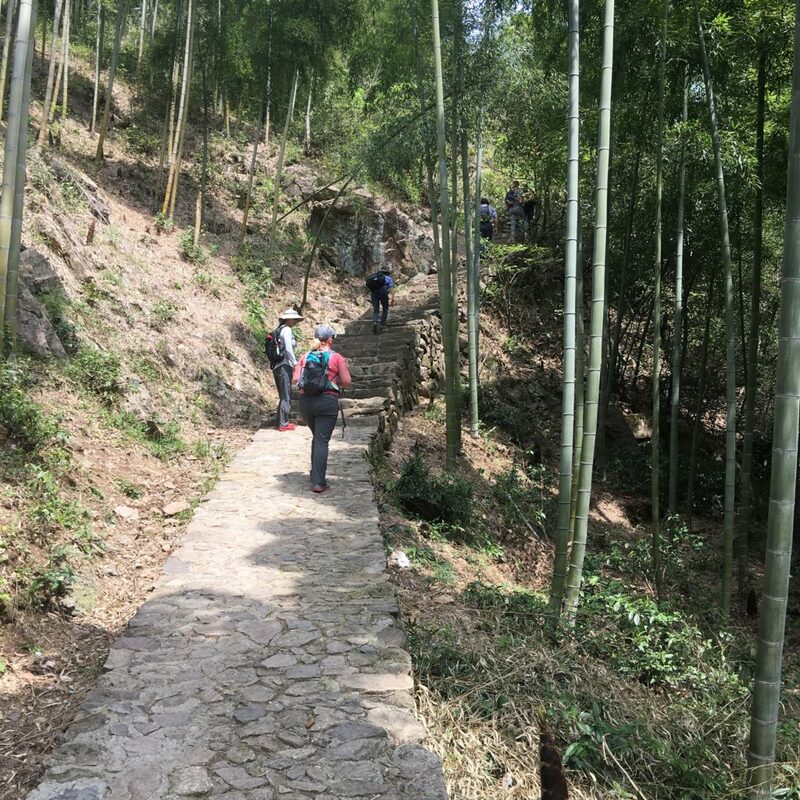 In the morning we’ll hike up to see the hundred-year-old mother bush of An Ji Bai Cha, which is the only one still alive. This valuable mother bush has made it possible for us to drink this wonderful tea today — all An Ji Bai Cha that is grown today has descended from it. We’ll have tea on the mountain with the family that guards this mother bush and take in a beautiful view of the valley. After tea and snacks we’ll head to the An Ji Bai Cha organic tea farm, walk through the field, and visit the factory to see how this tea is made. You will drive into the beautiful bamboo forest that surrounds Changxing. Our first stop is the Great Tang Dynasty Tribute Tea Museum, a stunning monument to tea built as a replica of the Tang Dynasty’s imperial tea factory (8th Century). Here you witness a special green tea ceremony preformed in the Museum, and take time to learn about the great tea master, Lu Yu, the author of the first tea book in history. We will also see a special demonstration of how the factory made tea for the emperors of the Tang Dynasty. You will then travel to Purple Bamboo Shoot tea garden and have lunch at the tea master’s family home. Lunch will be prepared from the fresh vegetables growing around the tea garden. The tea master will take you on a hike into the forest and up into her tea gardens. You’ll see how Purple Bamboo Shoot green tea is harvested and made in her small factory. Of course, you will get to drink freshly made Purple Bamboo Shoot green tea too! Today we will learn about Mo Gan Huang Ya, a rare yellow tea grown in Zhejiang. Only a few older countryside tea masters know how to make this tea! You will meet Wang Qi Zhen, our Mo Gan Huang Ya master, who has gained notoriety not only by being the best in the countryside, but also because she’s a woman in a traditionally male-dominated industry. We’ll take a walk through her organic tea garden at the top of Mo Gan Mountain, where you’ll have vistas of the whole county and a hands-on picking experience with the local tea bushes. Then we will travel to the factory and see the special process for making this tea. Of course, we will drink some of the Ms. Wang’s tea as well! In the afternoon, we will leave Mo Gan Shan for Hangzhou city, one of China’s most important cultural sites. Hangzhou is a beautiful city that’s popular with Chinese and foreign tourists alike. Hangzhou is known as the Tea Capital of China. When we arrive in the afternoon, we stroll around the city’s famous West Lake and enjoy its vistas. Today we will visit with the oldest and most decorated tea master of Shi Feng Dragon Well, West Lake’s most famous green tea, originally designated for tribute to the Qing emperor. 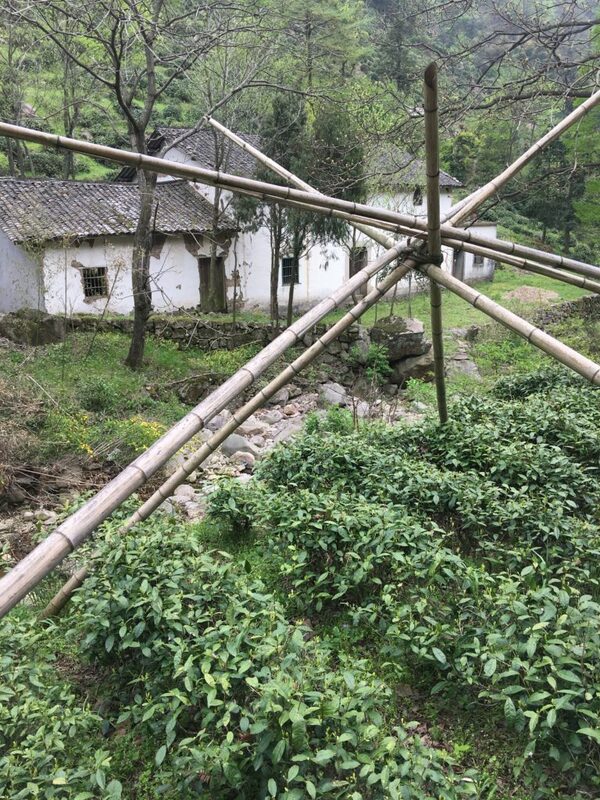 With him we will learn about the traditional skills involved in hand-crafting this prestigious tea and walk through his tea garden in Shi Feng village. In his garden we will see the differences between local seed-grown tea bush varieties and newer modern cultivars. After lunch, we will stroll through the Qing Dynasty emperor’s Tea Garden near by. From there, we will go to visit the Hangzhou Tea Museum to see exhibits that span the 4500 year history of tea in China. Today we will travel to Xinchang county, famous for producing a style of Long Jing or Dragon Well green tea. We will visit the largest wholesale market for Dragon Well tea in China, where you will be able to see the myriad of grades and varieties that are all sold as “Dragon Well” tea. Our tea maker, who’s company built this wholesale market, will guide us through the wholesale market and then will take us to an organic tea garden. We will see how the tea is made and how different grades of quality are judged by their professional staff. We will also see how different varieties are blended together to make the most widely known green tea in China. A visit to Xinchang would not be complete without stopping by the famous Da Fo temple, home to a 1,600 year-old statue of the Buddha that is 15 meters (50 feet) tall. The tea Da Fo Long Jing takes its name from this statue. The Chinese International Tea Culture Institute is one of the main national governing bodies for the tea industry in China. Here we will study the culture of Chinese tea brewing, experiencing how to make tea in formal and informal ways. A certified Tea Ceremony Master from the institute, Ms. Liang, will host you for both “family style” tea and a Chinese tea ceremony. You’ll have a good night’s sleep (covered in the cost of tour) and be ready for your journey home the next day. You can schedule your departure for this day or spend more time in Hangzhou if you choose. Touring the Chinese countryside is physically demanding. On this tour, be prepared to walk, hike, and travel by van and bus. The days will be long, because we want to make sure you see as much as possible. We usually start our day around 8:00am, and get back to the hotel after 8:00pm. Over the past several years we have learned that plans in China are always subject to change. Flexibility is key, especially in the countryside where few foreigners have ventured. We appreciate your flexibility, and will do everything possible to ensure that this tea tour exceeds your wildest expectations.